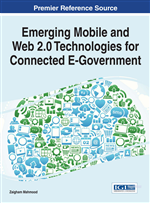 Connected Government suggests provisioning of a government's services to its citizens using the Web and communications technologies employing the latest software development paradigms and related methodologies. This also requires appropriate integration of, and interaction between, software applications and e-services developed by various government departments as well as the other influencing sectors of the society such as commerce. This is especially so as the connected government (c-government) applications require open, flexible, interoperable, collaborative, and integrated architecture to provide services for the emerging technologies such as mobile, cloud, and big data. This, in turn, suggests a robust and standard mechanism to develop such applications and services. In this context, Service-Oriented Architecture (SOA) is an attractive approach to adopt. SOA has already been proven successful in providing such a framework for delivering software applications as services with flexibility and multi-platform and multi-channel integration that are necessarily required for c-government application offerings. This chapter provides a discussion of the SOA paradigm and the associated citizen and administrative requirements. The chapter also presents a service-oriented architectural framework based on a set of evaluated application characteristics that support newer technologies. A number of service-component models have also been proposed that provide required customisation, reuse, flexibility, and extensibility. In the context of the proposed overall service-oriented architecture, a large-scale sub-system that the authors term “e-Taxservice” has been used as a case study. The study has a service design that has been validated against a set of key service quality attributes. Service Oriented Architecture (SOA) is an architectural style for developing and integrating large applications. It is an organisational and technical framework to enable an organisation to deliver self-describing and platform independent business functionality (Cartwright et al., 2006) providing a way of sharing functions, typically, business functions, in a widespread and flexible way, that is necessarily required when integrating applications developed by various governmental agencies. The idea is that functionality is developed as a number of independent components, called services and then services connected in the correct way to form bigger complete applications. SOA is, therefore, a broad, standalone and standards based framework in which services are built, deployed, managed and orchestrated in pursuit of an agile and resilient IT infrastructure (Mahmood, 2007). Furthermore, this architecture aims to provide enterprise business solutions that can extend or change on demand. SOA is being certainly established as a disruptive and transformative business technology for the booming ICT and software development domain.